We Restore Your Peace Of Mind! Need Infiniti Repairs? As a member of the Assured Performance Network, our facility and technicians are certified in Infiniti repairs. You can relax throughout the repair process knowing that your vehicle will be restored to factory specifications. When working with a certified Infiniti body shop, you car is guaranteed to be repaired using strict factory guidelines, tools and parts. This is why we confidently back our repairs with a Lifetime Warranty. If you live in the Morrisville or Cary area and have an Infiniti that was involved in an accident, contact Triangle Collision at (919) 460-7693 or fill out the form on this page. Please let us know which insurance companies may be involved so that we can give you the best advice to on getting a fair settlement. Lifetime Warranties for repairs and paint! We stand behind our Certified Infiniti repairs with Lifetime Warranties for many of our services. Your safety is our top priority. We guarantee that our repairs will keep your safety and performance features functioning as they were designed. Were you involved in an accident? 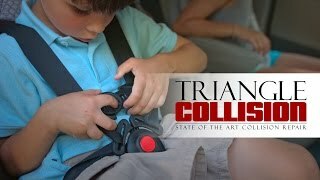 At Triangle Collision, we restore your vehicle back to pre-accident condition. To request an estimate for your vehicle, give us a call at (919) 251-6612 or fill out a contact form. After an accident, you have a lot of questions that need to be answered. As a member of the Assured Performance Network we have a proven ability, and the necessary equipment to restore your Infiniti to meet factory specifications. Modern Infiniti’s require a modern repair process. We follow factory guidelines during every repair. Protect your investment by bringing your Infiniti to Triangle Collision Center. It’s your choice, not the insurance companies, where your vehicle is repaired. Choose Triangle Collision, the Cary, NC area’s premiere Infiniti Body Shop & Collision Center. Modern Infiniti vehicles need to be restored according to a strict repair process. Safety features have to be perfectly calibrated, so even seemingly minor repairs should be handled with the attention to detail that they would receive in the factory. Working with a Certified Infiniti Body Shop will help to protect your investment. After our job is done, there will be no signs that your vehicle was in a collision. This will help maintain your resale value, and also can keep factory warranties intact. Infiniti continues to push the boundaries of automotive safety. This provides a challenge for Infiniti repairs that Triangle gladly meets. We never cut corners during the repair process because that could leave our customers at risk in the event of another collision. Each piece of your Infiniti has been designed into the complex and modern safety structure. When repairing your vehicle, we make sure that each safety component is structurally sound and calibrated just as the factory designed it. We are here for you from the very first step of the repair process. Our partnership with Lemon’s Wrecker Service allows us to transport your vehicle from the scene of the accident, to our garage. We bring the same dedication to quality to everything that we do. You can rest assured that your vehicle will be transported safely, minimizing damage. We also roll the transportation cost into the overall repair cost. This makes it easier to include towing in the insurance claim. Working with insurance companies can be confusing. We work with every major insurance provider to help make the repair process as smooth as possible. Our experienced staff will make sure your vehicle is repaired to pre-accident condition. Restoring your vehicles safety and performance is important. It’s also important to repair your vehicles paint and refinishing as well. Our refinishing services are backed by our Lifetime Warranty for repair. Not only will this ensure that your Infiniti is looking good, but it will help to protect its value as well. Want To Schedule A Free Estimate or Post Repair Inspection?